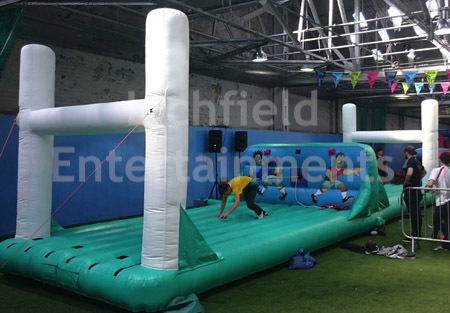 Rodeo Rugby Ball and Rugby Bungee Run - Rugby themed entertainment hire. 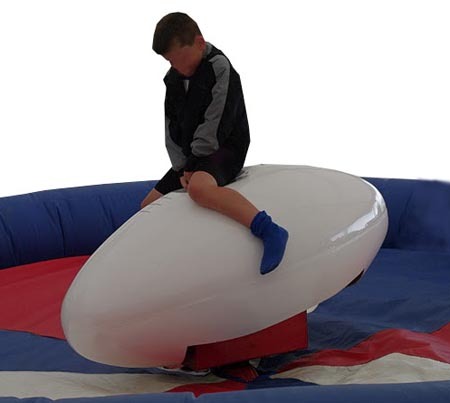 Our Rodeo Rugby Ball is a recent addition to our range of rodeo rides and bought especially for some events we're doing for the organisers of the 2015 WRC. It's available for hire for parties, rugby club events, and rugby themed promotions. The ride is always operated by our trained operator on your behalf and each ride is timed automatically to add a competitive element. The ride can be operated indoors or outdoors. The ride requires a space of 17x17ft and 9ft height clearance for indoor events. If outdoors and using the inflatable shelter that we provide free of charge you'll need 23x23ft. All access points need to be at least 33inches wide in order for the equipment to pass through. Another rugby themed game is our Rugby Bungee Eliminator. In this game you have two players, one at either end of the same bungee rope, racing to be the first to score three tries by placing the velcro batons, one at a time, under the inflatable posts. It sounds easy enough but when you have your opponent on the opposite end of the same stretchy rope battling to do the same its easier said than done. The inflatable requires an overall operating space of 50x20ft with a height clearance of 14ft if going indoors or under cover. This game is supplied with a trained supervisor as standard to ensure its safe use. The game comes with two different resistance strength ropes so it can be used by both children and adults. If you have any queries, questions, or would like to hire the rodeo rugby ball please click to enquire and we will do all we can to help.